With yet another holiday upon us, we take time this weekend to celebrate some of the spooky, kooky facts around the upcoming Halloween celebration. Trick-or-treating harks back to the Middle Ages and All Souls’ Day, when poor people in Britain would beg for soul cakes, a sweet-bread treat, and pray for dead relatives in return. When trick-or-treating first became popular in the United States in the 1800s, more children played mischievous pranks than asked for candy. By the 1950s, though, the focus had switched to good old family fun, with sugar-hyped children dressed in costumes. The candy-collecting tradition has spread from the United States to Canada, Australia, and Western Europe, where more and more little goblins now trick-or-treat. In parts of England, children carry lanterns called punkies (which look like jack-o’-lanterns) and parade through their towns on the last Thursday of October. In Ireland, rural neighborhoods light bonfires, and children play snap apple, in which they try to take a bite from apples that are hung by strings from a tree or a door frame. Chocolate makes up about three-quarters of a trick-or-treater’s loot, according to the National Confectioners Association. In the event that the candy isn't scarfed down that first night, separate chocolate out and keep it in a cool, dark, dry place. Milk chocolate is good for no more than 8 to 10 months, while dark chocolate lasts up to two years. Hard candy will also stay fresh in a cool, dry place for about a year. Make sure to store any soft candies in a covered dish away from direct heat and light. Enjoy them within six months. 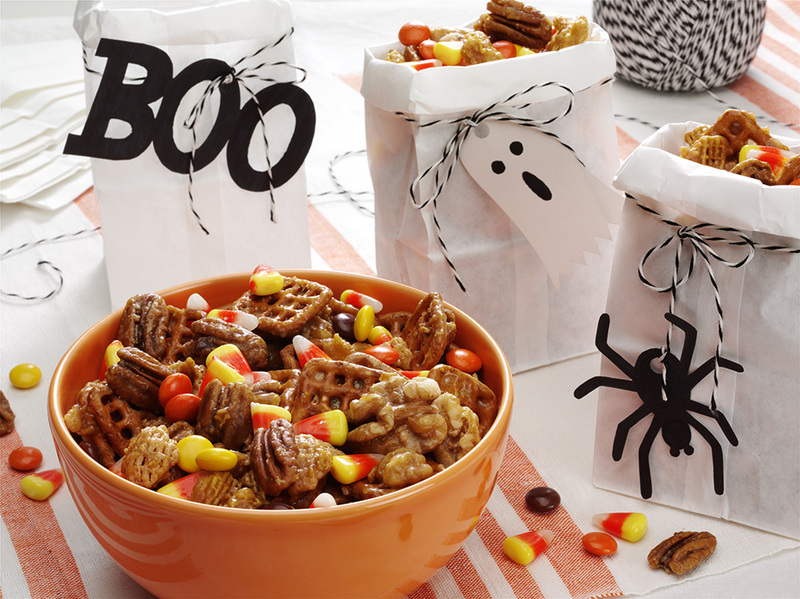 If you find yourself with more candy than you know what you do with, put your leftover sweets to good use by sharing them with neighbors or coworkers. Candy corn has been made with the same recipe by the Jelly Belly Candy Company since around 1900. What's in that recipe, exactly? Sugar, corn syrup, and marshmallow. One serving (about 30 pieces) has 140 calories, the equivalent of three miniature Hershey bars. The National Confectioners Association reports that more than 35 million pounds were manufactured in 2015, amounting to almost 9 billion kernels.